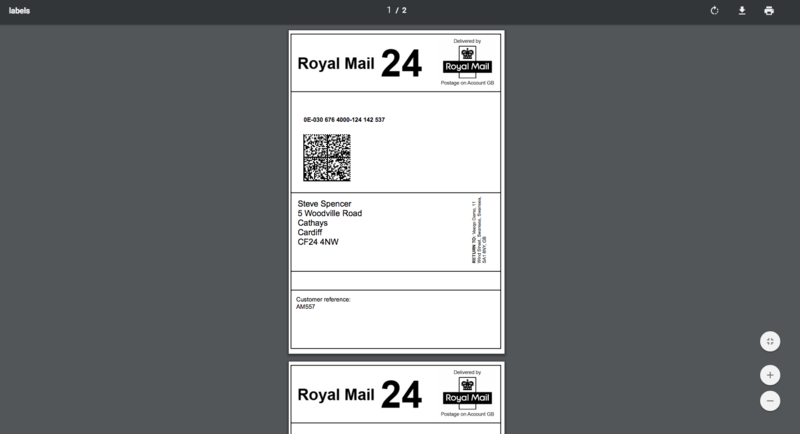 You can print up to 100 orders Royal Mail shipping labels with a few clicks. Before you Bulk Ship with Royal Mail you will first need to set up Shipping Rules, so that Veeqo know which Royal Mail services to assign to each order based on the rules you set. There is a Show Options button where you can decide if you wish to send email confirmation to the customer and update sales stores. 3. Labels will open in PDF format in a new tab. Click print and your labels will print out one after the other. Alternatively you can close this page and print invoices with the labels embedded if you prefer, see integrated invoices for more info. If the labels do not open in a new tab then please check you do not have pop ups blocked as this will prevent the labels from opening. You must ensure you have weights stored in your products and shipping rules already created in order for Bulk Shipping to work.